I have been playing with my black scarf warp for a week now and feel that, at last, I am slowly getting to know the “beast”. There have been some adventures along the way. I am not so nervous now about the fineness of the threads. While broken warp threads are a major nuisance, they really aren’t that hard to fix once you have a system. Having said that, I haven’t broken many. As it turns out this Guatemalan cotton is surprisingly resilient. I like it. 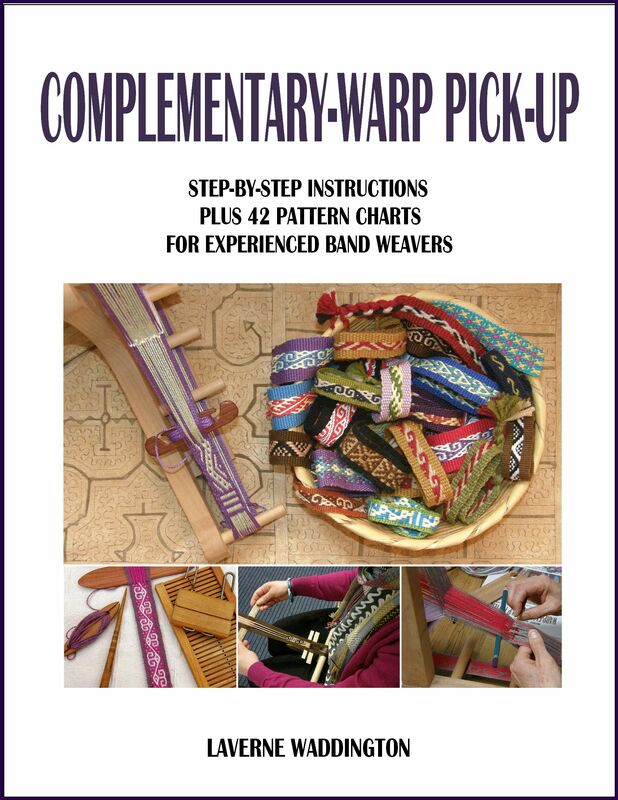 I have learned to slowly and softly strum the warps with the blunt end of my pretty Guatemalan pick-up sticks (pictured at left) as I open the sheds. I insert the sword and shuttle carefully. Hitting a thread along the way will either loosen or break it. I think that loose threads are possibly even more annoying and more difficult to remedy than broken ones. In the meantime I enjoy sitting back now and then to look at the smooth silky curtain of unwoven thread in front of me. It is impossible to see each individual thread. They all merge into a black glossy sheet of loveliness which I have tried without success to capture in a photograph. Is this warp a black beast or a black beauty? You may be surprised to find that I have not really advanced at all since I showed you the piece last week. While I haven’t advanced in terms of inches happily woven, I have advanced in lessons learned. There were, in fact, many inches woven….and then sadly un-woven, woven and un-woven yet again….before I could feel happy with what I was producing. And that showed me more than anything how much abuse this cotton thread could stand. Firstly I had to give in to the fact that it was useless trying to weave a 7-inch piece of fabric on a warp that clearly wanted to be wider. Lesson 1: Sometimes a “wee” sample just isn’t going to do the trick! The teeny tiny band that I hastily wove to test this new-to-me yarn simply did not have enough ends to give me a true reading of the width I could expect. So, after un-weaving and starting to weave the black beast once again, I let it settle into the width it was yearning to be. Lesson 2: Don’t get so caught up in happily playing with the supplementary-weft patterns, that you neglect to keep a close eye on what is happening to the ground weave. Yes, I was having a lovely time playing with the soumak technique and didn’t notice how much the ground weave, or the “canvas” on which I was placing the patterns, was becoming distorted. This was a sign that I was stuffing too much supplementary-weft into the sheds. 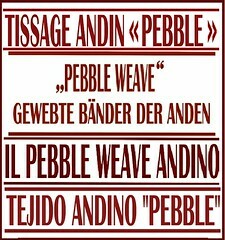 The material that I was using for the supplementary weft, 8/2 tencel, was not appropriate. Lesson 3: Several strands of fine yarn work better as a supplementary weft than just two strands of a thicker yarn. I already knew this!! but, I was in really new territory with this fine yarn and again, my sample had “lied” to me! So, it was out with the 8/2 tencel and, yippee, I got to use my new 60/2 silk. So, instead of two 8/2 tencel sausage-like strands, I used six to eight strands of the 60/2 silk which emerged from the ground weave to lie side by side like a glossy satin sheet on the surface of the fabric. Lesson 4: Not everything that is labeled as 60/2 silk in the bargain basket at the yarn store is, in fact, 60/2. Imagine the frustration…. I kept doing my sampling with six strands the off-white silk pictured above as I have more of that than the colors. Then I would weave the “real thing” with the colors. But things just weren’t working out. Why? The off-white 60/2 is at least twice as thick as the colored 60/2’s!…go figure. Lesson 5: Slow down! A little extra planning goes a long way. It was beautiful to see a video of Bhutanese weaver Leki Wangmo at work on an incredibly richly patterned piece of fabric. It was as if she had cast her arm across the warp and scattered seeds. Then we got to watch as the the seeds sprouted and flourished into patterns. It all seemed so random but, without a doubt, it was all carefully thought through and planned from the moment the first warp thread wound its way about the warping stakes. The strategic placement of the stripes and the placement of the particular patterns within them was all part of the overall plan. It was hard for me, having so many photos and books with images of designs to use on my scarf, to carefully select and plan the layout of my piece. I wanted to weave and try everything at once! Result…mess! Un-weave and start again! So, here it is. It may look much the same to you as what I showed you last week but it is, in fact, a little wider, the colors are slightly different and I am using silk weft instead of tencel. Funny how some of the small skeins of white thread dyed in the one black dye bath came out more intensely black than others…another “go figure”. I need to even up the length of the exit points of the supplementary wefts so they look neater and more consistent. Now I am taking it all more slowly…enjoying rather than fearing the fineness of the cotton warp threads, appreciating the smoothness of the silk weft. I no longer think “Aargh!…sticky warp”. I gently strum and the sheds open cleanly. Now to sit down and map out a design. While I sit and feel pleased with my seven-and-a-bit-inch piece of cloth as it takes shape on the loom, I remember the backstrap weavers from Tacabamba, Peru that I met in Cusco with their equally fine cotton ikat-patterned shawls measuring up to a meter in width Humbling!! Oh so very humbling!! 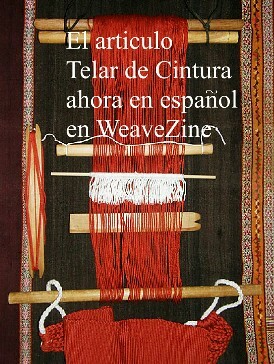 The simple backstrap loom of Tacabamba, Peru on which the indigo ikat-patterned “panones” are woven. 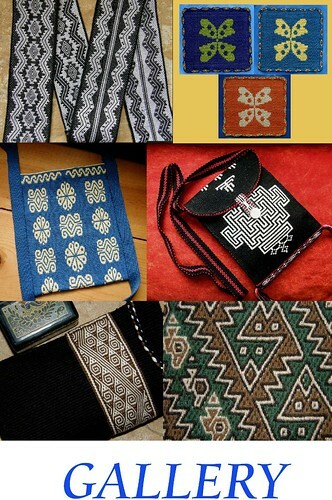 They are up to one-meter wide, covered with tiny motifs and have patterns knotted into their fringes. Of course, the warp lying idle on the ground attracted many admirers, all anxious to see it spring to life. Nila sits while she prepares the loom for weaving. The weaving itself is done standing up. A few final adjustments were made before weaving could begin. Then Nila asked the crowd to stand back and give her more room and we all understood why when she raised the very long sword and shuttle to be placed within the sheds. Now you can watch Nila at work!…The video starts with laughter as Nila nearly clobbers an onlooker, who got too close, with her sword! I love the way she gently pats the warp to separate the threads. That is her way of dealing with any stickiness. I love her balance…one arm outstretched to help her stay centered while the other reaches to pass the shuttle. It’s like a dance. Here’s Tacabamba weaver Laura wearing one of the shawls…something to aspire to??? So, I head back to my wee 7-inch piece hoping that I will end up with something that has at least some of the lovely drape that those warp-faced shawls have! 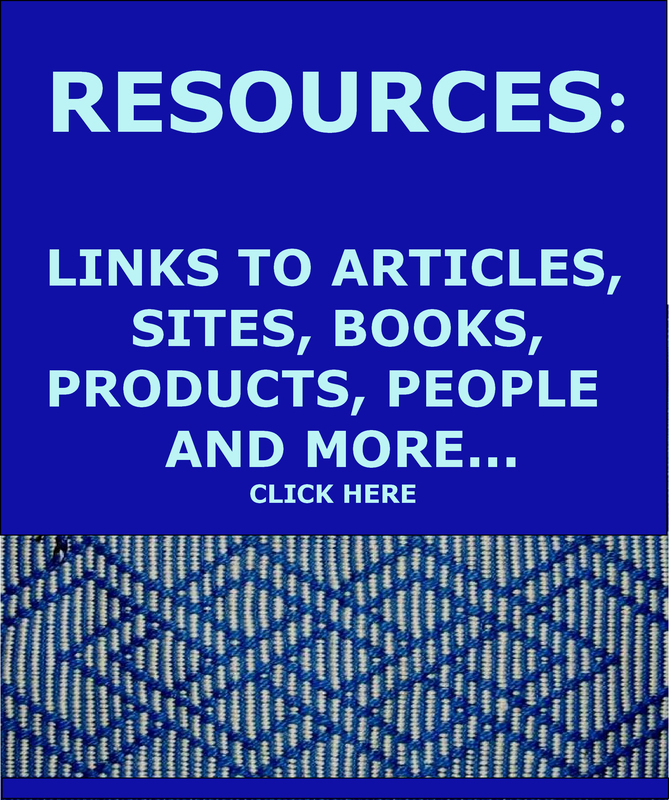 « Backstrap Weaving – Encuentro de Tejedores de las Americas – Part Three…and more…. Sometimes the difference in the size of the yarn can be caused by the dye used. Dark colours are often thicker than whites. It doesn’t matter when you are using an 8 ply knitting yarn, but it does matter using a 60/2 silk because its so fine! The difference in the blacks could be because they were in different dye baths, or one skein went in later than the other or even that one skein has not been rinsed as well as the other, or had a different base colour under the black! We are so used to seeing commercial products with a uniform colour, we forget that hand crafted products often have these little “imperfections” that are not really a fault or a flaw, but proof that this is truly a unique piece of art, one of a kind, and there never will be another one exactly the same! Its what makes it precious! You are so right, Caroline. This piece definitely has that nice “handmade” look! OH my! Humbling is right! Your work, Laverne, is so humbling to me. I find myself so eager to try all the designs from your two books, but cannot keep up. Your willingness to unweave, learn, adapt and grow is very encouraging. These contribute greatly to your excellent teaching skills. Thank you. Once again, another post that makes my heart sing. You are such an inspiration. Thanks so much for sharing this with us! It allways happens to me and then say to my self… it doesn´t matters, dear silly, because it means your starting to understand it. It is wonderful to realise that sometimes it also happens to THE MASTERS. Thanks again for this six lessons,. As a lesson I´m adding your strong determination, that encourage me to go ahead after failing. There are lots of “fails” Luzmila. We are all in the same boat, so when you tell me about problems with your weaving I KNOW how you feel! I just don’t always dedicate an entire blog post to the oopsies!! 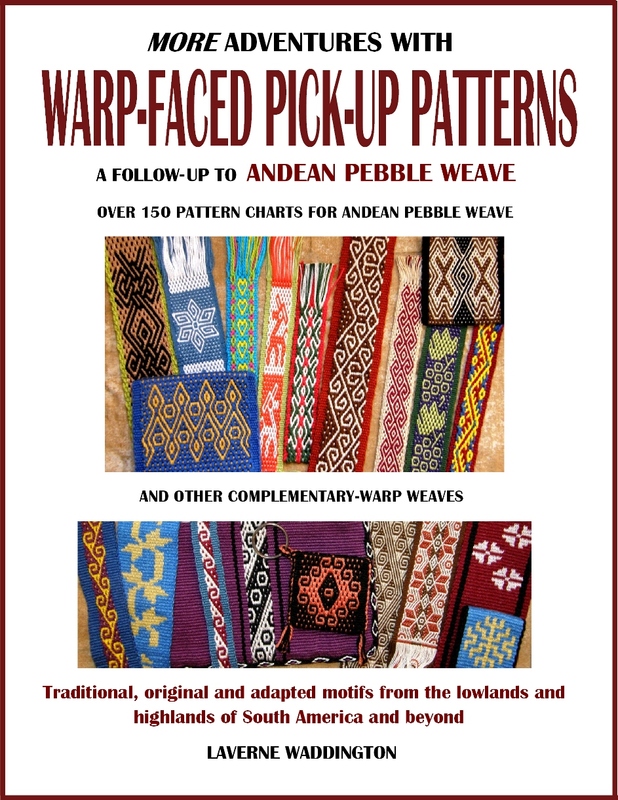 I admire anyone who has the sticktoitiveness to weave and unweave… try this and if that doesn’t work try something else. Your black beauty will be a masterpiece when you are finished. Next time you are in the area I’ll have to show you some of the woven ikat I have from the Makong River region of Thailand. Thank you for taking us along on your journey’s. Thanks Terri. I am using that highlighter tape that you gave me for the pick-up on the current wall hanging project…it’s good stuff!